Ahh yes. I really love this gun! Looks extra heavy and sturdy. Nice work, my lad! 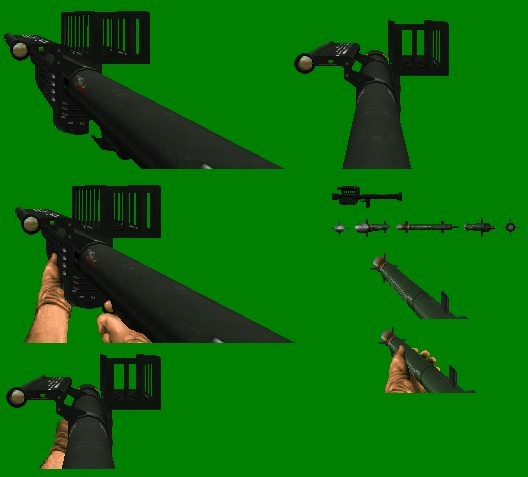 Glad to Sprite a good weapon model finally. And this weapon looks potentially Serious enough! Originally uploaded by Solais, the member of Croteam. 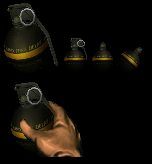 Newly uploaded by Biomechanoid from Steam Workshop as an addon. Have some casings from Chasm: The Rift! May I use these casings for ZRift? Ooooh sure thing! Thank you so much for considering use of my humble work. Last edited by Captain J on Thu Jul 19, 2018 12:48 pm, edited 1 time in total. So you're behind those sprites that I saw in many mods? Coolio! Don't thank me, thank the modders whomever used my humble sprites! They did some gratefully wonderful job. Some PDA sprite i worked on. Last edited by Captain J on Thu Sep 13, 2018 3:22 am, edited 1 time in total. Super old Crossbow that actually used for Black Mesa before. Planned to rip this model but forgotten it for a long time... Until now. Original by some user called .SoJa, as far as the information goes in Gamebanana.com. Super Done!! 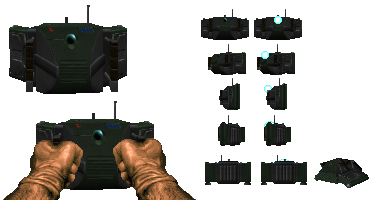 Classic-Shooter-Friendly Sized Weapon sprites of XLBA version of Marathon 2: Durandal! Many thanks to Vostyok for such delicious information. I really had fun making these sprites! 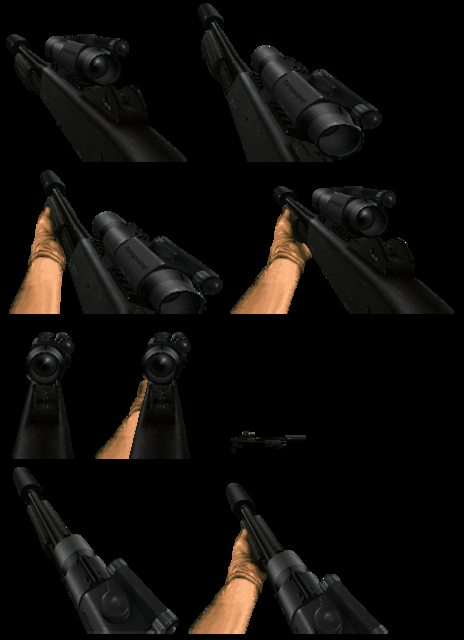 However i couldn't edit other weapon sprites because... I prefer them sprites angled. TBH, some idle weapon sprites in Marathon series are weird yet fun to look at. They are too much slim, circular and such, can't even recognize what does they look like. If anyone's got the guts to make the other sprites angled, be my guest! Also there was no HD version of 10mm casing sprites, so that stinks. At least i've made shotgun casing one tho. Credit gloriously goes to Bungie Software. Awesome work. I've been thinking of doing something with these but glad they were useful to you. 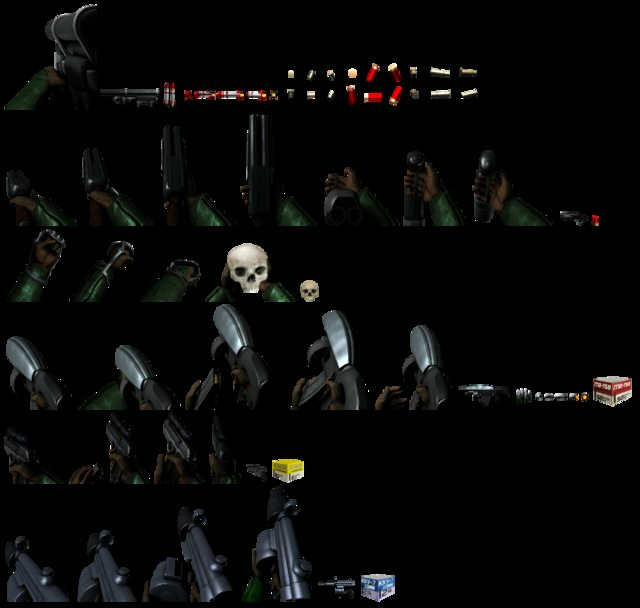 Might you be interested in doing something with the 3D Marathon weapons from Resurrection for UT99 or Rampancy for Half Life? The former even has a new weapon in the form of the Athena .7-Class Railgun, which appears where sniper rifles used to be in CTF maps. Thanks Vostyok! I could've create those beauties thanks to you. Anyway SiFi270, that's very intriguing! I'll check those mods later. This is gonna be fun. 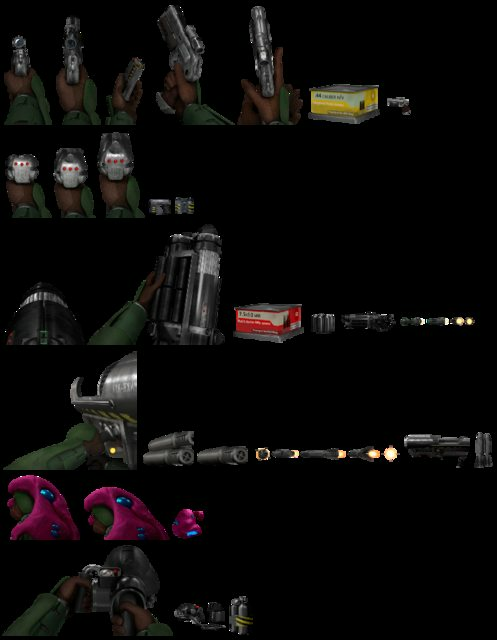 Anyway, i have edited some weapon sprites of HD Reskin mod for Marathon 1. Now finally they less look Cartoony, which is really better! 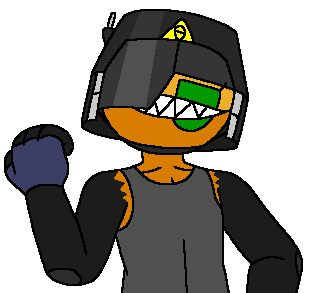 But alas, i couldn't edit the fists because some sprite of it was too blurry. Also this reskin mod has very few weapon animations so i couldn't make angled sprites... But i'm still grateful though! Credit goes to General Tacticus at simplici7y.com. 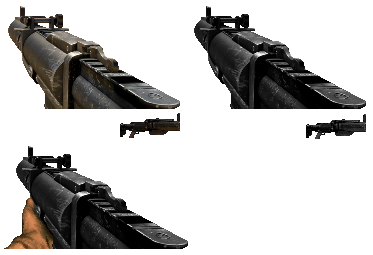 Kudos for awesomely improved Marathon 1 weapon models! 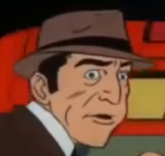 I'm getting old, i guess. Some of them doesn't look perfect to my eyes. Improvements are always welcome, tho!